The Most Scrumptious Vanilla Cupcakes Ever ♥ / Renée Alexis. This morning I decided to do something somewhat productive to kick off school break. So naturally I whipped up a batch of vanilla cupcakes. I was originally going to make a dozen chocolate chip muffins but of course, when I started combining everything without really thinking it though, I realised we were out of chocolate chips.. *note to self: check pantry stock before mixing ingredients together* Not that this was a massive problem or anything, because this recipe is literally the best vanilla cupcake recipe i've ever used, definitely a blessing in disguise. The mixture is incredibly light weight and moist even after having some resting time. Here's what you'll need to make your new favourite cupcakes. ~Firstly preheat the oven to 170°C (fan forced) and line your muffin tray with paper cases around the same size. ~Then in a large mixing bowl beat butter and sugar together until pale and fluffy. ~Afterwards, in a separate bowl, whisk eggs and vanilla together. Add small amounts of this mixture to the butter and sugar and beat well after each addition. ~Sift flour into the bowl and gently fold through. ~Pour in the milk and mix gently with a wooden spoon to form a smooth batter. ~Distribute mixture between the cake cases. If you plan on adding frosting or icing to your cupcakes afterwards, fill the cases up around halfway, they're a lot easier to ice afterwards. ~Bake for 20-25 minutes or until they're a nice light brown on the top. 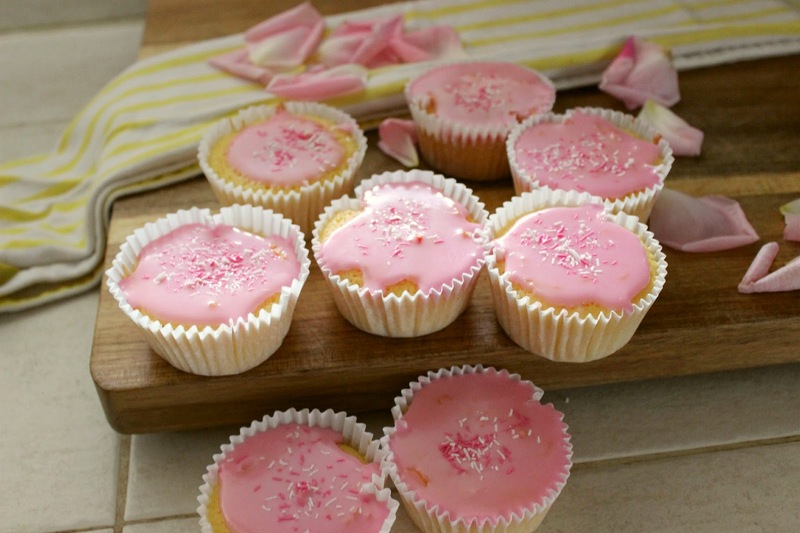 ~Make sure your little cupcakes have completely cooled down before frosting them. ~Sift the icing sugar into a medium sized bowl. ~Gently and gradually pour in your fresh lemon juice and mix until smooth. If its clumping up, add a few drops of water, and if too runny add the necessary amount of icing sugar to thicken the mixture up. ~To intensify the flavour, add your lemon zest. ~Add your food colouring when icing is smooth and glossy. Spread evenly over cupcakes. This particular recipe makes around 12 standard muffin sized cupcakes and should be stored in an airtight container. It's definitely best to eat them within 3-5 days after making them and if you choose to ice your lovely cupcakes keep them in the refrigerator.